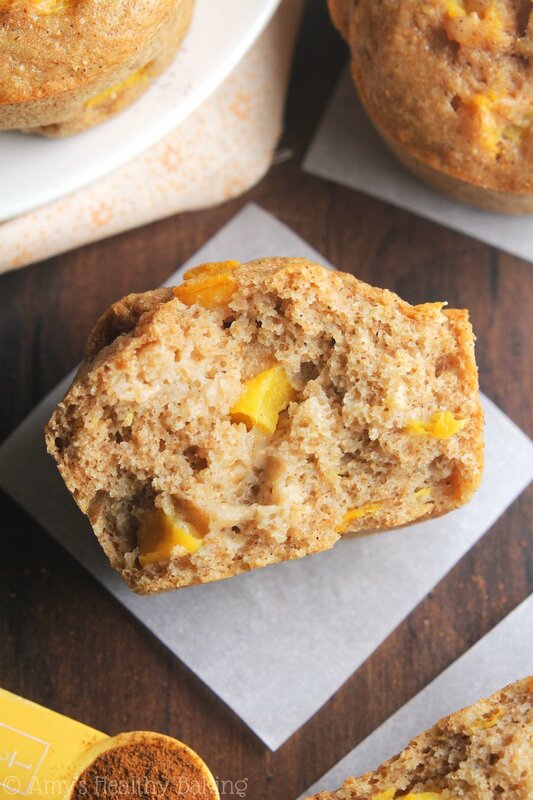 Tender whole wheat muffins full of juicy peaches and a hint of maple syrup for sweetness. They taste just as juicy and bright as summer! After an army of ants invaded our home and ate their way through many of my baking ingredients, I drove down to my parents’ house for a slightly extended visit—and to borrow their kitchen. They graciously cleared off a few shelves in their pantry for my freshly purchased flour and chocolate chips, then gave me free reign of the dining room for photographing my baked goodies. I have the best parents! Shortly after I arrived on my parents’ doorstep, some of their college friends flew into town from the Midwest for a week-long vacation. My parents planned on taking them and their adorable 3-year-old daughter around the San Francisco suburbs to see the sights before heading up to their cabin in the mountains for a couple days of leisurely hikes and swimming at the lake. They fell onto the ground and cracked into one gooey, golden yellow mess. Turns out the fridge was way fuller than the pantry, and I had a much harder time finding space for my perishable ingredients in there! Oh well. If there’s no crying in baseball and no crying over spilled milk, I suppose there’s no crying over scrambled eggs spread across the kitchen floor either! 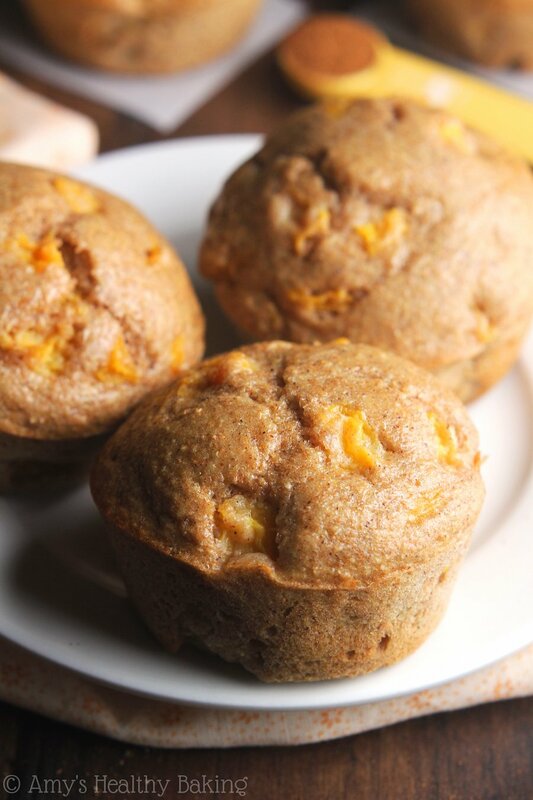 But on the bright side, I managed to mix up the rest of the batter and slide these Small Batch Maple Peach Muffins into the oven without another mishap! I nearly wished I had doubled the recipe though… Their sweet scent wafting around the kitchen practically tempted me to eat half of them in one sitting! The dry ingredients are fairly predictable: whole wheat flour, leaveners, salt, and cinnamon. 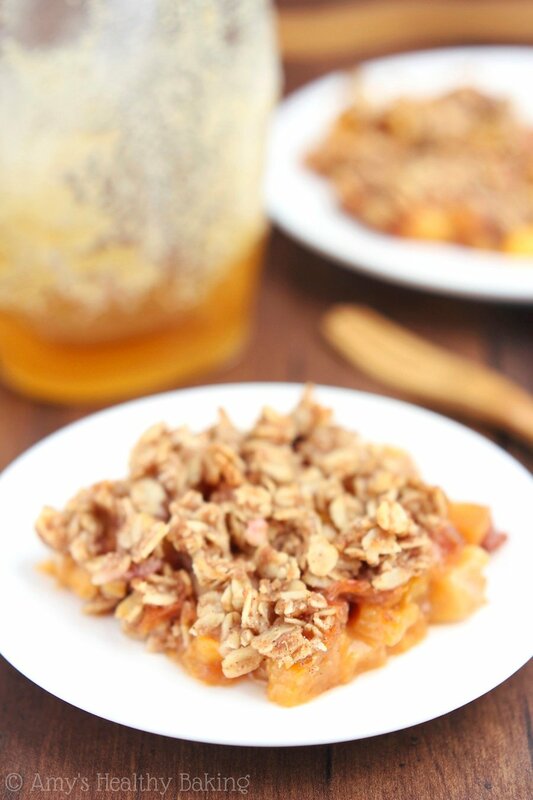 My grandma always bakes her peach pie with cinnamon, so I add it to almost all of my peach recipes too! 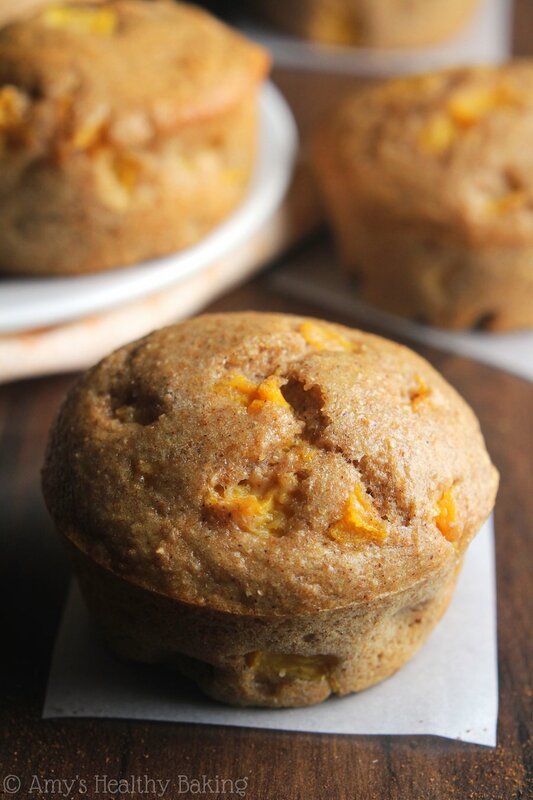 Grandma’s peach pie is literally the best thing about summers for our family… But since I probably shouldn’t eat pie for breakfast, these muffins will do just fine! With very little butter and one egg white, these muffins get the majority of their tender texture from Greek yogurt. 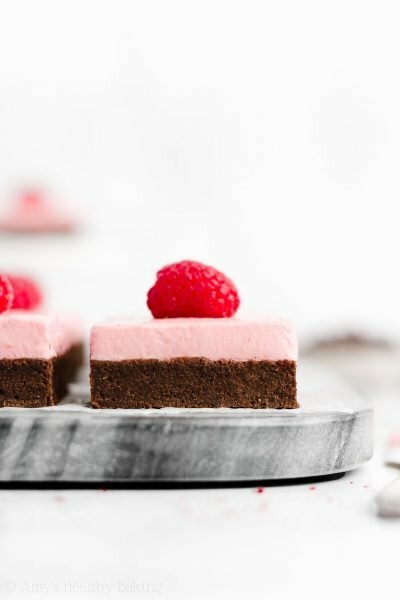 It’s my secret weapon in healthier baking recipes! Greek yogurt adds the same moisture as extra butter or oil but for a fraction of the calories. Plus it gives your baked goods a little protein boost! Now for the star of the show… The peaches! We’ll add a generous amount because I hate biting into a fruity muffin only to come up with a mouthful of bread and not a single morsel of fruit. 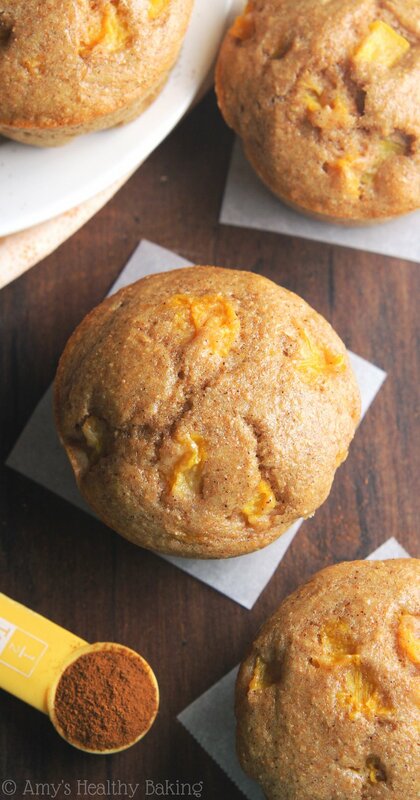 Peaches that are fresh, frozen and thawed, or canned in 100% juice and drained will all work for this recipe, which means you can make these muffins all year round! And that’s definitely a good thing in my book. ?? And when you make your own, remember to snap a picture and share it on Instagram using #amyshealthybaking and tagging @amyshealthybaking IN the photo itself! (That guarantees I’ll see your picture! ?) I’d love to see your muffins and feature them in my Sunday Spotlight series! 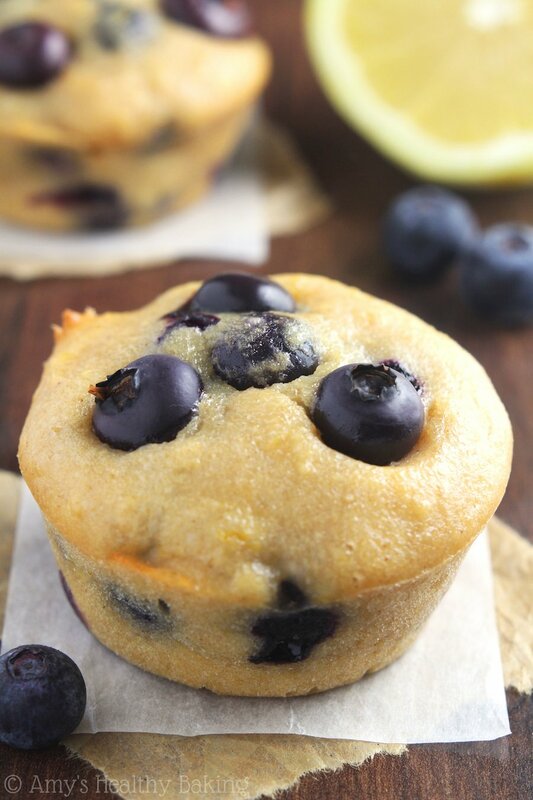 These tender muffins are full of juicy fruit and are perfect for breakfasts or on-the-go snacks. Store any leftovers in an airtight container in the refrigerator for up to 5 days. Preheat the oven to 350°F, and lightly coat 6 muffin cups with nonstick cooking spray. 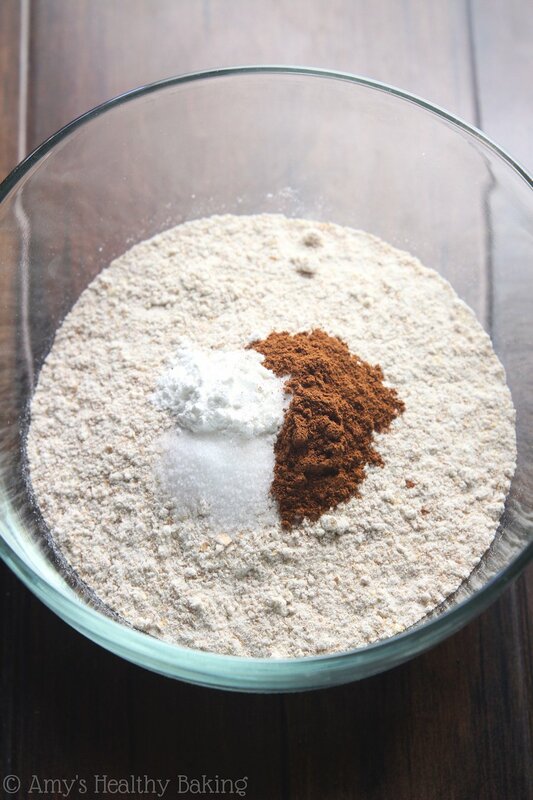 In a small bowl, whisk together the flour, cinnamon, baking powder, baking soda, and salt. In a separate bowl, whisk together the coconut oil, egg white, and vanilla. Stir in the Greek yogurt, mixing until no large lumps remain. Stir in the maple syrup. Alternate between adding the flour mixture and milk to the syrup mixture, beginning and ending with the flour, and stirring just until incorporated. Fold in the peaches. Evenly divide the batter between the prepared muffin cups. Bake at 350°F for 19-21 minutes, or until a toothpick inserted into the center comes out clean. Cool in the pan for 5 minutes before transferring to a wire rack. Notes: Whole wheat pastry flour, white whole wheat flour, or all-purpose flour may be substituted in place of the whole wheat flour. 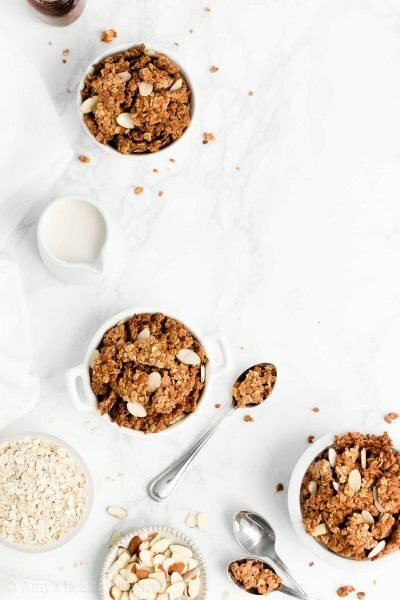 For a gluten-free version, I recommend the following blend: ½ cup (60g) millet flour, ¼ cup (30g) tapioca flour, ¼ cup (30g) brown rice flour, and ¾ tsp xanthan gum. Peaches that are fresh, frozen and thawed, or canned in 100% juice and drained will all work for this recipe. 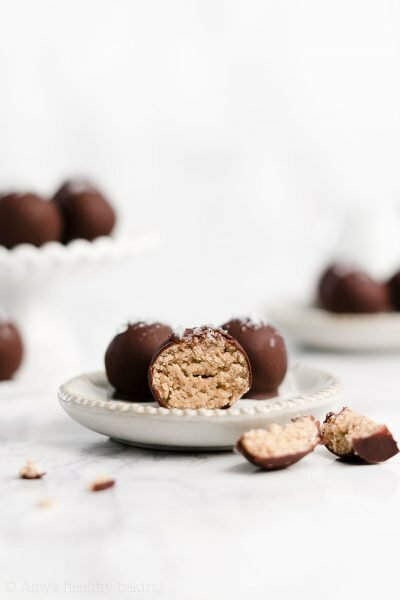 We just made these and they are delicious! Do you know if they can be frozen? I’m so glad you enjoyed the muffins Alicia! 🙂 They freeze really well, too! Hi Amy, I’m just wondering how do you usually use the remaining egg yolks – if you have to use just the whites for the recipes like this. P.S. I’m so glad I’ve found your website! It’s so good to enjoy baking (and eating what you bake, too! :)) without feeling guilty about crazy amounts of sugar and butter in regular recipes, or even worth in store bought baked goods (where sugar and butter are the least of all possible evils I guess…) Thank you for all the great recipes! I’m so glad you’re enjoying my recipes Natalia! That means a lot to me! 🙂 I just throw away the egg yolks. One side of my family has problems with high cholesterol, so I don’t want to risk it! 😉 I’ve heard other people have had luck with freezing egg yolks or turning them into lemon curd. 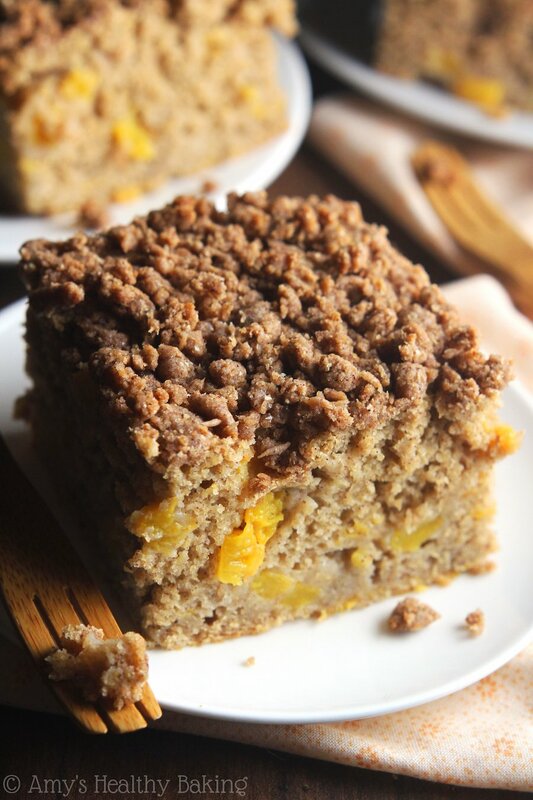 My blog friend Karen has a great recipe for that here (but it definitely isn’t healthy! ), if you’re interested. I can’t wait to hear what you think of these muffins if you try them! YUM!! Peaches are one of our favs. Mine too Charlotte! 🙂 I’d love to hear what you think of these muffins if you try them! Thanks, just what we were looking for- healthy, small batch, natural sugars, and low-fat. Fabulous! Hi, Amy! 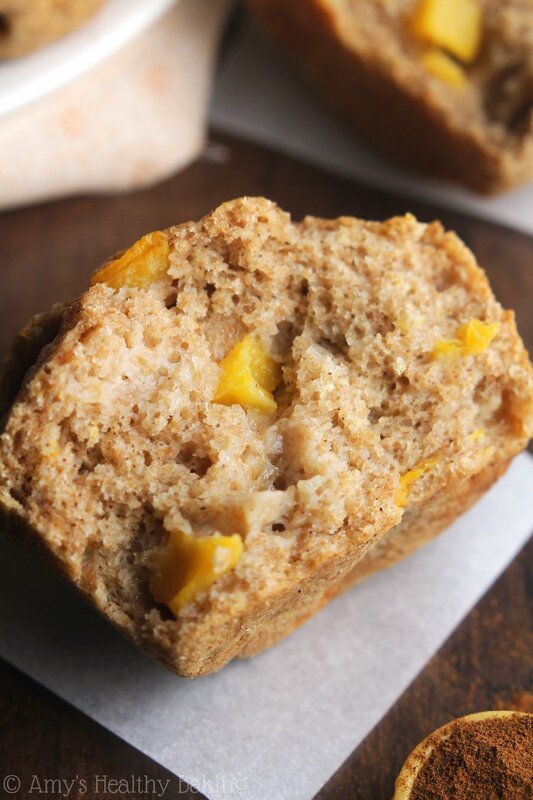 My CSA has been rather generous with peaches this year, and my husband really wanted me to try your maple peach muffin recipe when he saw it referenced in the CSA’s newsletter. I was skeptical since I’ve never made “healthy” baked goods before. Meals? Yes. Baked goods? Never. However, setting all skepticism aside, tonight I made a double batch of the muffins using all-purpose flour. THESE MUFFINS ARE FANTASTIC!!! Who needs refined sugar and canola oil? Apparently, we don’t! Next time I’ll try them with whole-wheat flour. Thanks so much for the recipe. I look forward to seeing what other healthy goodies you’ve created. 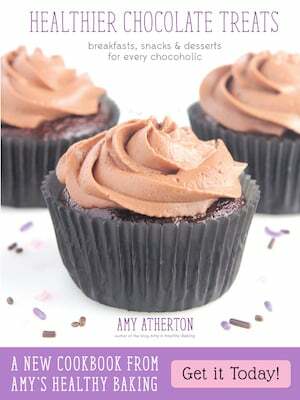 I wouldn’t be suprised if your “Healthier Chocolate Treats” cookbook made it’s way into my Christmas stocking this year. 😉 Wishing you continued success. 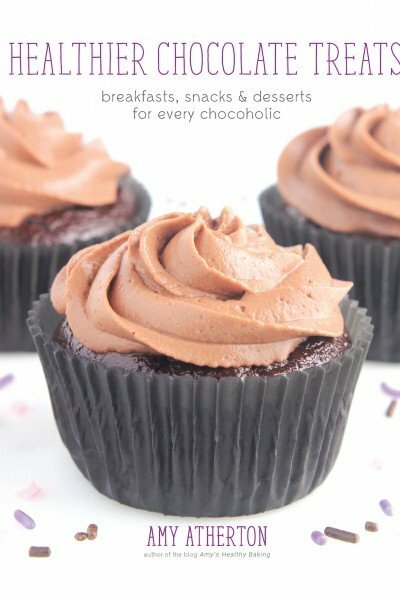 I just made these this morning and they’re delicious. I used whole wheat pastry flour , butter, and fresh peaches. Wonderful! I’m so glad you enjoyed these muffins Sarah! That means the world to me that you’d want to bake them again — thank you for sharing that with me! 🙂 I love hearing your recipe modifications too — it’s always fun to see what tweaks work! These were amazing! I was skeptical of the low amount of fat, but the yogurt really does make a difference. I doubled the recipe, using a mix of all purpose, whole wheat, and buckwheat flour. I also used a whole egg, and subbed pureed frozen peaches for chopped, because that’s what I had on hand. I will definitely make more of these to freeze! 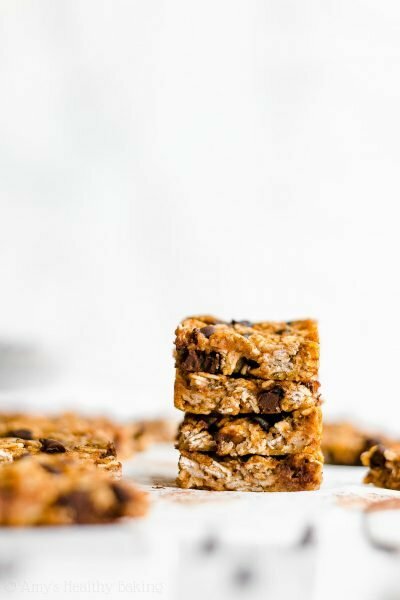 I’m nursing a newborn and I have a toddler who loves muffins, so I love that this recipe is an easy, healthy snack that will please all of us! I’m so glad you and your children enjoyed these muffins Esta! I’m so honored that you’d want to make them again — thank you for taking the time to share that with me! 🙂 I really appreciate you including your recipe modifications too. I always love hearing what tweaks work!